Mahi Mahi with Brown Rice - Mahi Mahi fillets, olive oil, lemon juice, fresh basil, fresh rosemary, balsamic vinegar, garlic, Worcestershire sauce, soy sauce, brown rice. Mahi Mahi Almondine - Mahi mahi fillets, garlic, almonds, parsley, butter. Mahi Mahi with Spicy Papaya Salad - Mahi mahi fillets, plum sauce, soy sauce, cilantro, jalapeno, papaya, kiwi fruit. Sesame Crusted Mahi Mahi - Mahi Mahi fillets, ginger, lemon, white wine, heavy cream, sesame seeds, black sesame seeds. 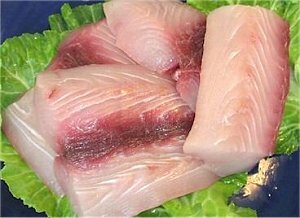 Baked Mahi Mahi - Mahi fish fillets, olive oil, soy sauce, orange, lemon, lime, bay leaves, garlic, fennel, red onion, ginger..
Grilled Mahi Mahi with Avocado Salsa - Mahi Mahi fillets, avocado, red onion, tomatoes, cilantro, lemon juice. Grilled Mahi Mahi with Pineapple Salad - Mahi Mahi fillets, pancetta, pineapple, mango, orange, sweet onion, lettuce with tangy spicy dressing. Grill Smoked Honey & Lemon Marinated Mahi Mahi - Fish fillets, honey, lemon juice, olive oil, liquid smoke. Mahi Mahi with Asparagus and Cashews - Mahi fillets, onion, ginger, grated orange rind, lemon juice, honey, soy sauce, asparagus, roasted cashews, cilantro. Mahi Mahi Grilled with Salad - Mahi Mahi fillets, cucumber, artichoke hearts, bell pepper, sweet onion, lettuce, mache, fresh basil, lemon juice. Teriyaki Mahi Mahi - Mahi mahi fillets, teriyaki sauce, lemon juice, honey, sesame seeds.